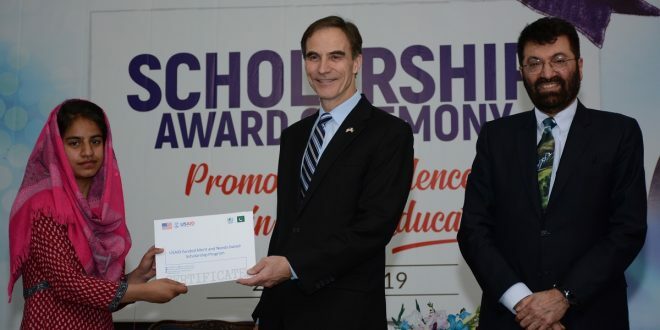 ISLAMABAD: (March 21, 2019): As many as 262 undergraduate students from Pakistani universities were awarded scholarships under HEC-USAID Merit and Needs-based Scholarship Programme, during a ceremony held at the Commission Secretariat on Thursday. Dr. Tariq Banuri, Chairman HEC, Mr. Paul W. Jones, Chargé d’Affaires US Embassy, Lt. Gen. (Retd.) 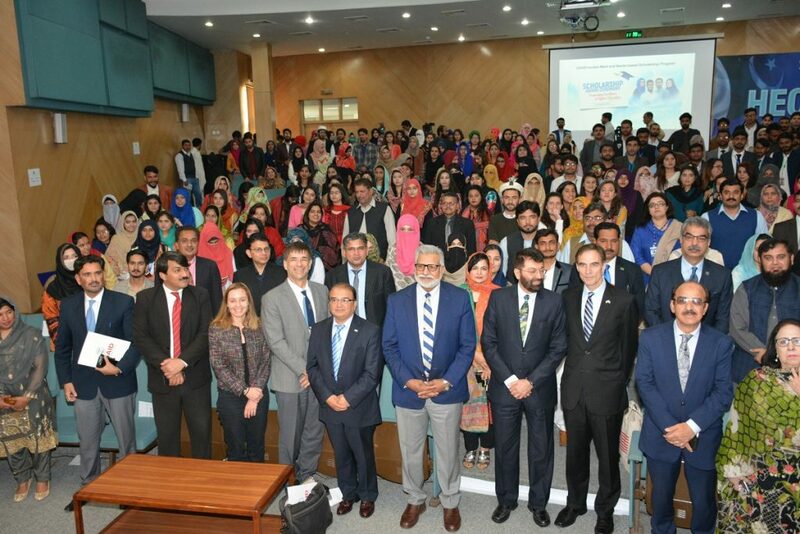 Muhammad Asghar, Executive Director HEC and a large number of students and the Programme alumni attended the ceremony. The scholarship recipients are the latest cohort to benefit from this Programme, which was started in 2004. So far more than 5300 talented youth from financially disadvantaged families across Pakistan have received these scholarships. The grant covers student housing, textbooks, stipend and tuition. 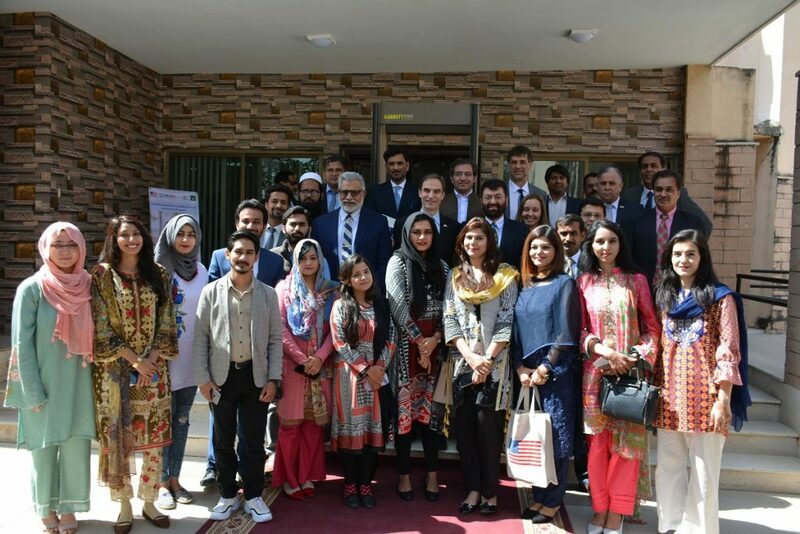 The scholarship recipients come from different areas of Pakistan including Gilgit, Sindh, Balochistan, South Punjab, and Khyber Pakhtunkhwa. They will be attending pursuing degrees in Agriculture, Business, Engineering, and Social Sciences in 16 different institutions . Speaking on the occasion, Dr. Tariq Banuri congratulated the scholarship recipients. He said the real resource of Pakistan is its people. Investing in our people will help the country overcome its socio-economic challenges. The Chairman said the HEC-USAID partnership is not merely an academic collaboration, as development of higher education sector is part of agenda of collaboration between the two sides. He said that in addition to this programme, both the countries have, over the years, developed extensive collaborations. He said that Pakistani youth have tremendous talent which needs to be tapped. The Government of Pakistan is committed to increasing access and quality of education, and the development of higher education sector is one of the highest priorities of the Government. Ambassador Jones said the young people of Pakistan represent Pakistan’s future. Unfortunately, fewer than 10 percent of them currently pursue higher education. Our partnership with the Higher Education Commission was forged by the idea that we should help open doors and opportunities to as many promising students as possible. Every bright and curious young person should be able to attend university and develop his or her full potential. He hoped that the scholarships will enable students to play an effective role in addressing various challenges facing the country. He said the scholarship recipients and alumni have inspiring stories as they are following their dreams making them come true. I cannot express how it feels to stand here today and share my experiences with this audience. Without support from HEC and the USAID, I would not have been able to complete my studies with distinction from a top business school of Pakistan.